If you live in Minnesota you are well aware that winter is and has been loud and proud recently. Below freezing temperatures, cold air, ice, and snow make the warmth inside your house cozy and inviting. At least, that is, when your house is up to the task. We have been experiencing a high volume of water damage jobs coming in with frozen pipes, or frozen houses for the matter, simply due to homeowners not servicing their furnaces and ductwork annually. 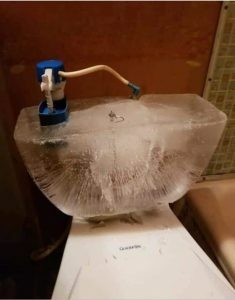 The picture here of the frozen toilet is REAL! Amazing right? Imagine what a disaster that could cause if not caught before it unthawed?! Keep reading for a quick reminder to why this is so important especially when you live in Minnesota. Check the house thermostat to ensure it works properly. Replace old thermostats with newer, programmable models that allow you to set a lower temperature while you are away or asleep and raise the temperature only when you need it. Lowering the temperature about 10 degrees for eight hours a day may save you up to 10 percent a year. Insulate ductwork that runs under your house or through unheated areas. Special blanket insulation makes insulating around the ducts easy, simple work. The typical house loses about 20 percent of the air flowing through the ducts due to holes, leaks and loose connections. Factoring in heat loss through insulated ducts, the amount is likely even higher. Should you experience frozen pipes, broken pipes or even an entire frozen house, 24Restore is the only call you will need to make. We will handle everything to help ease the stress for you and your family and get your home back to cozy and warm as fast as possible. Continue to stay warm and safe Minneapolis! Warmer temps are in sight!